Last weekend saw the passing of another great friend into the world of marriagedom and all that this brings! We had done the Stag Doo and even made a big thing of it (see last post!). We had even decided that we ought to further celebrate during the week of the fateful day itself but the day could be put off no longer. The Bride and Groom tied their knot on Saturday. There were a few interesting aspects to this great day. 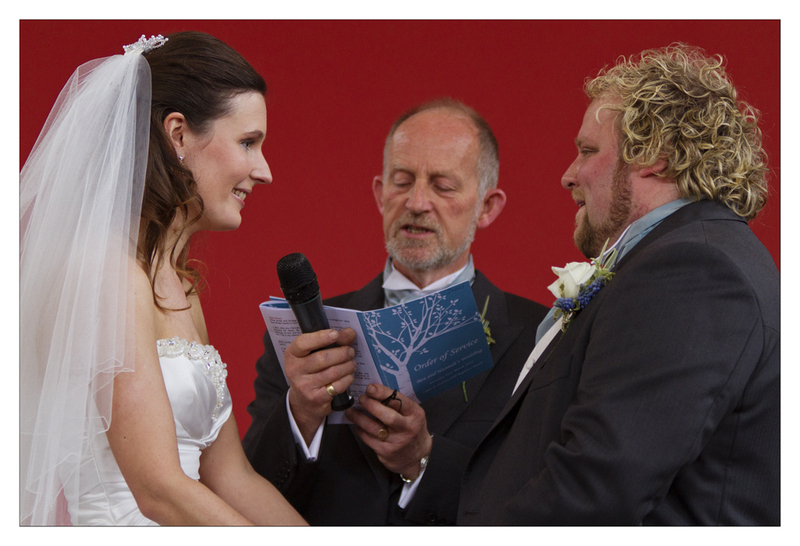 The first and most poignant was that the Groom’s Father, a very successful local Baptist Minister was to perform the Ceremony itself. The other interesting aspects were a mixture of the normal complicated family dynamics and nervous speakers and other participants. As is my want, I wandered around the day with cameras in tow, snapping in a low key more journalistic fashion. Annoying other guests by them realising too late that a ruddy great big 70-200mm was being pointed rather rudely in their general direction! 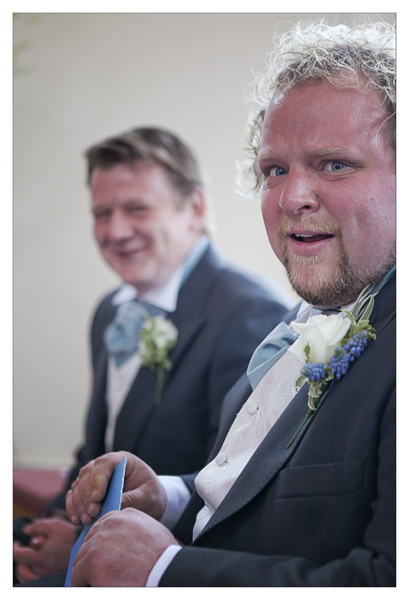 It also made me realise why I never hanker after being a Wedding Photographer myself. The job is way too stressful, technically difficult due to poor lighting and generally, on the day, you are seen as a necessary evil rather than a person of artistic flair and skill. Indeed, such is the (understandable) demand for certain ‘posed’ images, little free time is left for anything too artistic if anyone wanted them anyway! The Wedding itself took place in a lovely high-ceilinged Church in Wiltshire, bright, with trees guiding the happy couple forward to the middle front for the vows and swapping of expensive metal. The main wall behind proclaims Jesus is “King of Kings” but written large around the Cross and on a fantastic luxurious red emulsioned wall. Even so, my light meter reading was suggesting a paltry f2.8 even at 800/1600 iso. This really meant that for the official photographer, flash was nigh on a pre-requisite for any shots with depth. I, on the other hand, could snap on wafer thin focal lengths with both a 24-70mm @ 2.8 and a 70-200mm on a cropped sensor also at 2.8. This allowed me to hand hold at reasonable speeds with only a small amount of modern ‘noise’ on the shots that I am finding myself adding in post anyway! I left all of the normal official kind of shots to the pro wedding guy, he knew what he was up to and I spent most of my time seeking out interesting and poignant angles. I found myself way too often dragged towards the large gold letters written on the wall and couldn’t help framing the B&G with the Minister together with this stark and firm message. I grabbed a couple with rings and word exchanges but found it hard to capture ’emotion’ but hopefully this came through in a couple of them. It was then a small 20-30min drive to the venue for the reception which was a re-furbished Old Tythe Barn. Sadly, the lighting in here was a lot worse and meant flash only or don’t bother at all. I mostly didn’t shoot due to my dislike of on camera flash and the freedom it prevents. I can however see that a bit of homework on speeches would be worth it with some good reactions from story tellers and their subjects at times. After a far too long an evening spent tasting different wines, beers and spirits, the local Hotel that was to be our sanctuary was welcome after a bracing midnight walk. A wonderful day and a beautiful service followed by fantastic company and good old fashioned music and giggle! Processing finds me as always struggling to move away from the retro slide looks of Ektachrome and the like, giving the overall feel amore nostalgic, romantic look in my eyes. This week has seen me shooting another subject for my project. This time a friend who is completely gutting (and I mean completely gutting) a house for his new young family to move into later in the year. I wanted to grab him during a major piece of wall removal amidst the chaos and debris that goes along with this effort. It involved a well wrapped camera on a tripod and two 500 watt studio lights. I think I only held up the work for the equivalent of a tea break and I managed to get the shots I wanted. At least I hope I have! There are no second chances with this one! Business continues to be tough this year and breakthroughs feel harder with Corporate Sponsors for the large project. Determination hasn’t waned though so keep watching this space and remember, if you know anyone that might know someone in the right position in the right business, then please please let me know! Groom and Best Man. Nerves? What nerves!